On the morning of 8th December 1941 thousands of American, British, Dutch and other civilians of Allied nations living in China awoke to find that their countries were at war with Japan. Thousands of miles away from their home countries, they were cut off, isolated and faced an uncertain future. As the rigours of life under the occupation increased they were eventually herded into internment camps, known as Civilian Assembly Centres. There they experienced starvation rations, horrible sanitary conditions, virtually no medical care apart from what they provided themselves and an absolute lack of the essentials of civilised life. Yet through it all internees rose to meet the challenge of survival. they placed their hope in the future and educated their children, organised kitchens and hospitals, started libraries and engaged in subtle forms of resistance. Captives of Empire fills a major gap in the annals of World War II and that of prisoners of war. Here for the first time is the definitive history of the internment of Allied civilians in China. Private papers, diaries, letters and official reports, many long hidden, were utilized to bring a complete picture of interment to light. In preparing to write this book Dr Greg Leck combed through thousands of pages of documents from archives around the world. In personal interviews he listened to scores of internees describing their experiences. He researched, in depth, the histories of each camp as well as the stories of many internees. Together with Desmond Power, an Old China Hand and internee himself, information was organized and sorted to produce a database of over 13,000 internees held in China and Hong Kong. The result is a revealing and immensely fascinating look at the world of the internees. Captive of Empire gives you an inside look at the internment experience. From the idyllic life of the expatriate, to the shock and surprise of the Japanese victories and rule, to imprisonment and eventual liberation, it covers the panoply of this little known chapter of the Pacific war. Utilizing internees' own voices we see the food, the housing, the work, as well as the entertainments, games, escapes, births, lives and deaths of the camp. 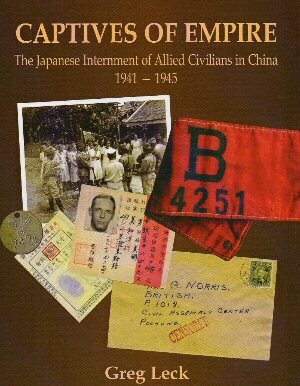 Profusely illustrated with maps, photographs, drawings, paintings, cartoons, posters and scarce and rare internment camp-related ephemera, this is a monograph which serves as the definitive reference work on the subject. Greg Leck is one of the foremost historians of Japanese internment camps in China. The grandson of an Old China Hand who served in the Chinese Maritime Customs and the son of a woman who was one of the last Britons to leave Shanghai he grew up hearing stories of China and internment.